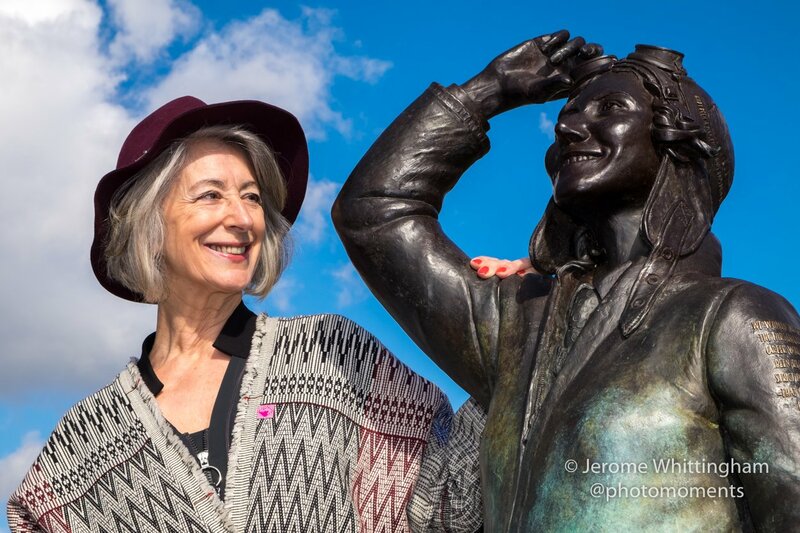 The grand finale of Amy Johnson Festival (except for the Big Moth Charity Auction next April) was the unveiling on Friday 30 September by Maureen Lipman of a beautiful bronze statue of Amy Johnson. Modelled and cast by sculptor Stephen Melton, the statue was a joint commission between Amy Johnson Festival Limited and Keepmoat Group, the housing developer largely responsible for the regeneration of the Hawthorn Avenue area of West Hull. The chosen site is on a new greenspace which will eventually provide a landscaped park for residents of the new housing, only a few hundred yards from St Georges Road where Amy was born in 1903, Boulevard and Alliance Avenue where she later lived. Access to the statue is currently a little restricted whilst the landscaping works are completed. The statue has its twin on the Promenade at Herne Bay, Kent, not far from the point in the Thames Estuary where Amy died in 1941.